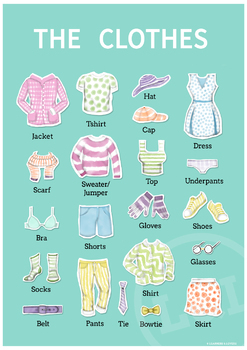 The CLOTHES vocabulary poster. Decoration. ESL/EFL/ELL. 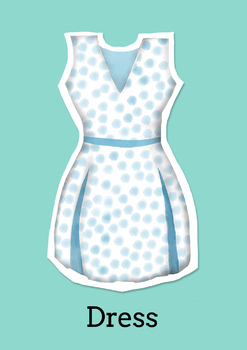 FREE Printable poster with beautiful artwork and classic CLOTHING vocabulary. Perfect for hanging in the classroom as decoration and for reference. File size supports A1 poster prints. 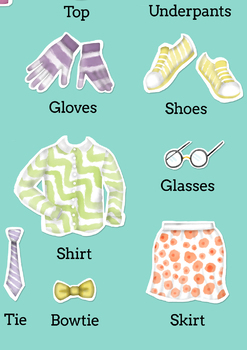 Words and drawings are: jacket, tshirt, hat, cap, dress, scarf, sweater/jumper, top, underpants, bra, shorts, gloves, shoes, socks, shirt, glasses, belt, pants, tie, bowtie, skirt. My wife and I made this poster for my EFL classroom in Wellington, New Zealand. Our mission was to make an attractive reference poster that was suitable for all levels and age groups. My class loved it and my colleagues all wanted copies too!